To speed up its land reform process, South Africa is strategically assisting white farmers move to other African countriespartly because the redistribution will create land shortage at home. The plan, envisaged by the Nelson Mandela government in 1994, aims to transfer 30 per cent of the white-owned farms to the landless by 2014. The government is also treading cautiously to avoid a Zimbabwe-like situation, where President Robert Mugabes land seizure plan caused the collapse of the economy. 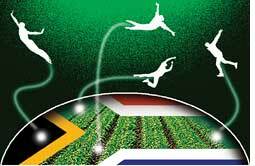 It is assisting its expropriated white farmers to re-establish their operations abroad and is negotiating with 12 countries.To encourage them move abroad, agriculture minister Tina Joemat Pettersson said at a time when India, China and the Gulf countries are rushing to buy land in Africa, South Africas high-skilled commercial farmers should help the government reap the benefits of overseas investment. In return, Pettersson assured, the government would allow them to retain some agricultural property at home. China, being the worlds largest buyer of iron ore, deserves a greater say in determining its price, said the countrys top negotiator for the steel-making mineral. Shan Shanghua, secretary general of China Iron and Steel Association said We will not blindly accept prices agreed by the other countries. Shan also argued for setting the prices on a calander-year basis instead of the current fiscal year system. Chinas steel industry, Shan said, would account for 60 per cent of the global iron trade in coming years. Following decades of struggle by Chiles Mapuche indigenous community, the government has acknowledged their territorial rights. President Michelle Bachelet said her government will distribute 33,000 hectares (ha) by March 2010 among Mapuches in the countrys southern region of Araucania. We have returned 650,000 ha to Mapuches since 1999, she said. Bachelet also proposed the creation of an Indian affairs ministry and a council of indigenous peoples. Mapuches, who make up four per cent of the countrys population, have been demanding constitutional recognition of their tribal identity, rights and culture, as well as ownership of the land that belonged to their ancestors. They have been struggling since Chile became a democratic nation in 1980. On October 16, Nigerias main militant group in the oil-rich Niger Delta, mend, declared the end of a 90-day ceasefire and said it is resuming attacks against the oil industry and military forces. mend (Movement for the Emanc-ipation of the Niger Delta) had suspended its attacks on oil installations, operated by foreign companies such as Shell and Chevron, and called the truce in July to allow for peacetalks following President Umaru Yar Aduas amnesty offer. 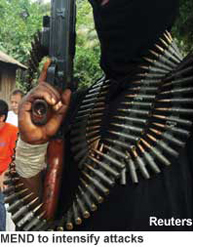 Thousands of militants, including several mend commanders disarmed under the deal.But the government failed to hold any formal discussion to address the problems of under-development and injustice in Niger Delta, said the group that claims to be fighting for fairer share of oil revenues for the impoverished residents of the region. In the next phase we will burn down all installations and no longer limit our attacks to the destruction of pipelines, mend said in statement. Attacks on oil installations have cut Nigerias output by a third in the past three years. Paris has initiated an investigation into allegations that the state-owned energy giant edf is dumping nuclear waste in Siberia. The allegations surfaced after a French documentary showed footage of nuclear waste stored in metal containers in the open in the Siberian town of Seversk. The documentary claimed edf, the worlds largest operator of nuclear power plants, ships 13 per cent of its spent fuel to Siberia and the town now sits on 1,500 tonnes of nuclear waste. But edf, which recently announced plans to build four more nuclear reactors in the UK, said the material is the recyclable uranium that would be enriched by Russian plants and later reused in European plants. Experts doubt the claim and say recyclable uranium is hardly reused by the industry. The documentary makers also point out that the situation revolves around a legal loopholerecycled uranium or plutonium is not classified as nuclear waste but as radioactive material. 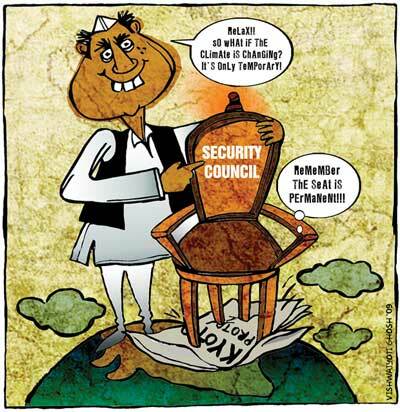 Hence international shipping of nuclear waste is not illegal. The allegations come at a time when France is looking for a nuclear waste storage site. As temperatures start to drop in Central Asia, Uzbekistan has cut natural gas supplies to southern Kyrgyzstan and reduced gas deliveries to northern part of the country by 70 per cent citing late payments and arrears. Uzbek authorities said they would resume the supply only after Kyrgyzstan pays off the entire US $19 million. As many Kyrgyz worry about how to stay warm this winter, the timing of the cut-off has prompted speculation about Uzbekistans motive. Some political analysts view it as punishment for Bishkeks recent decision to help Russia set up a military base near the Uzbek border in Ferghana valley. 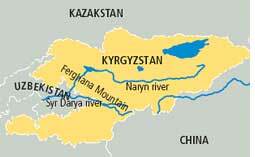 Kyrgyzstan retaliated when at a parliamentary session ministers demanded to block rivers flowing into Uzbekistan. The arid countrys agriculture depends on the water from Kyrgyzstan. Swiss researchers say Alpine glaciers fast melting due to global warming are releasing toxic pollutants that had been stored in the ice for decades. This could have dire environmental consequences on the pristine mountain range, they said in a study published in Environm-ental Science and Technology. The scientists studied sediments from Oberaarsee lake, a dam reservoir on the Alps, and found build-up of now-banned persistent organic pollutants (pops) such as dioxins and ddt. The pollutants have flowed from the nearby melting glacier that now feeds the lake. Though the level of pops in the atmosphere fell following bans in the 1970s, the scientists said, accelerated glacial melting could again release them into the atmosphere. Japans new government has suspended work on the Yamba dam, under construction for 50 years, in Gunma state calling it wasteful. In a bid to revitalize the countrys ailing economy, the government also plans to suspend work on 48 other government-funded under-construction dams and scrap several airport and highway projects. The Liberal Democratic Party, which ruled the country for nearly 50 years until the Democrats won the August election, had sanctioned projects worth billions of dollars. The new government under Prime Minister Yukio Hatoyama said it wants to free up the funds for new policies like handouts to farmers and poor families. Japan is the worlds fourth largest dam-building nation. Ireland banned the cultivation of genetically modified (GM) crops. It is part of a government effort to declare the country GM-free zone. The government also plans to introduce GM-free labels for food, including meat, poultry, eggs, fish and dairy produce, to boost its agri-food and eco tourism sectors. With this, Ireland joins Japan and Egypt that have banned the cultivation of GM crops. Mexico, considered the cradle of corn, has issued permits to grow GM corn for the first time in a bid to boost the production of its staple food. The government said it will be initially restricted to states where no native varieties are grown. Critics fear the GM crops could contaminate Mexicos ancient varieties of the grain. The agriculture ministry did not reveal which firms received the permits; 35 companies applied. The 2009 World Food Prize has been awarded to Gebisa Ejeta, an Ethiopian-born plant scientist working in Purdue University in usa for his contributions in developing sorghum hybrids resistant to drought and the devastating striga weed. The Hageen Dura-1 sorghum hybrids have increased the production of sorghum, one of the worlds five principal grains, and enhanced the food supply of hundreds of millions of people in sub-Saharan Africa, said the World Food Prize Foundation. The prize, known as the Nobel for Food, was created in 1986 by Norman Borlaug, father of green revolution.